Unicorn Pressed Juice has been another great brand in providing quality cold-pressed juices! With the vibrant colours and tastiness, their juice is just fun and lively! One of their must-try juices would be the Indigo Juice with purple cabbage, pear, green apple, and Himalayan rock salt. 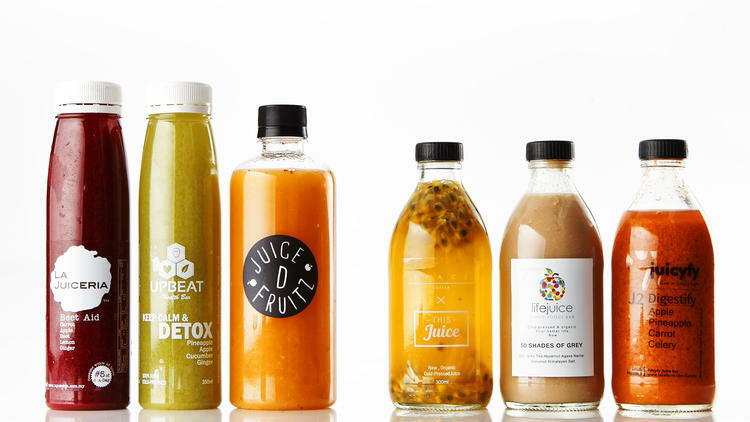 For 6 bottles of cold-pressed juices, it would cost you RM100 to RM130. If you love vegetable cold-pressed drinks, Unicorn Pressed Juice will be your choice because they have more flavours with vegetables in it. If you want to try out Unicorn Pressed Juice, you could order it online and they will deliver it to you! Elected No.3 Cold pressed juice brand in Malaysia they deliver fresh cold and organic juices to your doorstep in Kuala Lumpur, bringing magical goodness to you! Unicorn pressed juice took the cold-pressed culture of San Francisco, their juices are rich in taste and texture. Every bottle is rich in vitamin and flavour. So if you live in KLCC, Bangsar, Mont Kiara or Damansara Heights, then you should be lucky because they deliver their drink there! Fresh cold press juices delivered to your doorstep in Kuala Lumpur! Juice Cleanses laden with superfoods at your fingertips. Bringing Magical Goodness to you – Cold Pressed and Organic. With a name that is as unique, the Unicorn Pressed Juice offers to bring its customers some ‘magical goodness’. The juices are unique with blends that include purple cabbage, pear, green apple and Himalayan rock salt for the Indigo Juice, as well as Scarlet Juice which comes with beetroot, apple and white chia. The juices are sold in 6 bottles, and it is priced at RM120. Unicorn Pressed Juice is one of KL's best cold pressed juices! As featured in TIMEOUT. Indigo Juice is one of Malaysia's Must Try Juices! With their juice cleanses inspired by the colours of the rainbow, Unicorn Pressed Juice has a nice variety of juices to pick from. But our favourite would be the Indigo juice because we think purple cabbage deserves more recognition for their health benefits. Purple cabbage or red cabbage is full of anthocyanins, which could help to lower your risk of cancer, heart disease, macular degeneration and many more . Another juice worth checking out is the Yellow Juice. Made from lemon, arenga, ginger, mint leaves and cayenne pepper. Arenga aka coconut palm sugar is said to be better than white sugar because it still contain some nutrients from the coconut palm . Unicorn Pressed Juice, one of the five juiceries that delivery to your home. With the healthy food delivery services that have become available and with more popping up everywhere of late, this couldn’t be a better time to start getting on the health train! Being healthy doesn’t just stop at your main meals. These days, there are various ways to improve one’s health and diet and one of the most popular ways right now is the rise of the freshly pressed juices to complement your diet. Have you ever heard of people asking if you’ve had your ‘5-a-day’ intake? It’s a national campaign that a few countries (the USA, United Kingdom and Germany) to encourage consumption of at least 5 portions of fruits and vegetables a day. The World Health Organisation has recommended “a minimum of 400g of fruit and vegetables per day excluding potatoes and other starchy tubers” in their Global Strategy on Diet, Physical Activity and Health to promote fruit and vegetable consumption around the world. For some people, it can be a little tricky to have portions of 5 fresh fruits and vegetables a day, especially if you eat out often or if you’re not personally not a fan of fruits or veggies. However, it is not impossible. Juices are a terrific way to get in those recommended portions of fruits and vegetables. All you have to do is drink the lot and you’re sorted! No need to prepare the vegetables or fruits – just drink. Time is very precious for many and a lot of us simply don’t have the time to go grocery shopping. Thus, food deliveries is the answer, such as getting your grocery shopping done online or having your meals delivered to you. Food deliveries have now gotten better because there are now juiceries that deliver freshly pressed juices to your home. So, getting healthy has never gotten more convenient! This is the new kid in the juice world. Having just arrived in the later part of 2014, Unicorn Pressed Juice took its inspiration from the Cold Pressed juice culture in San Francisco, USA. Since opening, they’ve gotten quite a following because their juices are are pressed only after the juices have been ordered. This ensures the freshness and less chances of the juices oxidising. They use a variety of fruits, vegetables and nuts for their juices. At present, they deliver to areas in KLCC, Bangsar, Mont Kiara and Bukit Damansara. 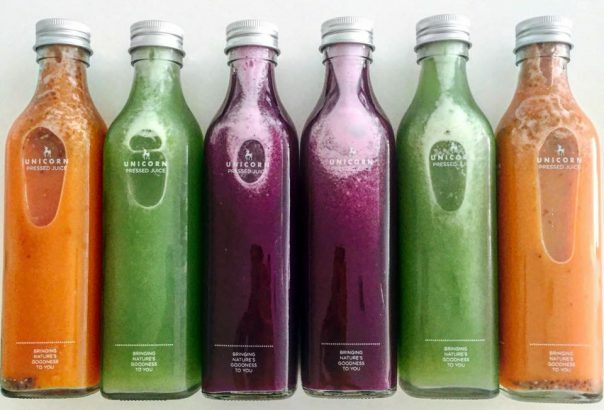 "10 Best Cold-Pressed Juices in Msia"
Unicorn Pressed Juice arrived in Kuala Lumpur late 2014. This relatively new comer took its inspiration from the Cold Press culture in San Fransico. They have been warmly received in Kuala Lumpur so far. Unicorn juices are pressed only after they have been ordered to ensure freshness and least oxidation . Their produce consist of premium quality fruits, nuts, and vegetables. The Rainbow Cleanses are substantial and have gained popularity of late. Their nutrition-dense juices are rich in taste and texture.The unicorns make sure to pump superfoods in every bottle. Some flavours like the Amber Juice has Chia seeds in it, which create an interesting texture compared to your typical juices. The Madagascan Vanilla beans in their Almond Mylk add a distinctive flavour. Every bottle is full of body and flavour - an indulgence that is actually good for you! They strive to bring nature's magical goodness in a bottle right to your doorstep! They deliver to KLCC, Bangsar, Mont Kiara and Damansara Heights.